I had heard really good things about this movie even though I don’t remember it actually making it to any local theaters. I happened across it when looking for something else at my local library, so I grabbed it, too. The premise is that Barbara, a middle school student, constantly prepares for battles with giants. She tests out different baits, she rigs enormous traps, she keeps careful field notes, and, according to her, she kills a giant and saves her town about once a month. Barbara clearly has issues. She’s awkward, disheveled, anti-social, and could be too smart for her own good. For some reason, her older sister is raising Barbara and her older brother, and doing a rather poor job of it. Before long, Zoe Saldana’s character appears. She’s a school psychologist and desperately wants to help Barbara, even though Barbara is fairly uncooperative in almost every way imaginable. The movie is very coy about the giants issues. It leads you to believe this is all make-believe–that Barbara is clearly disturbed and acting upon an intricate fantasy. However, it also heavily suggests that everything happening pertaining to the giants is absolutely real–that it’s not in Barbara’s head at all. The movie moves along pretty slowly, if I’m being honest. It spends a lot of time walking this line between “is this real or not.” There were several moments when I almost turned the movie off because it seemed to keep hitting that note without progressing beyond. However, the last twenty minutes of I Kill Giants definitely made the entire movie worthwhile. Everything comes full circle, everything is satisfactorily explained, and the film concludes on a far more emotionally potent note than I ever expected. Do I recommend this movie? I do, but you definitely have to be in a patient mood to watch it. It does not shy away from delving into the complexities of adolescent psychology, nor is it in a terrible rush to resolve itself. Some of the characters are woefully one-dimensional, and very few of them are actually likable. This willingness to be … abrasive … is part of the movie’s charm, though. On a final note, when I say the movie satisfactorily explained the issue of the giants, I don’t mean literally. If you’re looking for a clear, concise, definitive answer on whether or not she is actually killing giants … you probably won’t be happy. For me, though, the ending tied it all together sensibly enough and with enough heart that I was willing to suspend any logic and rationale and enjoy it as the creators’ probably intended. Probably. 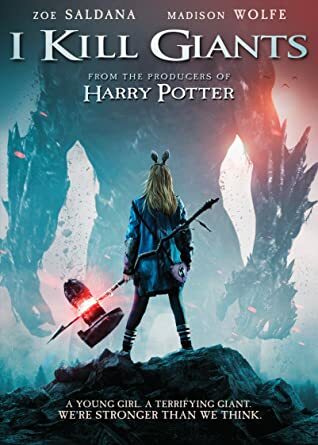 This entry was posted in Movie Reviews and tagged arts, entertainment, i kill giants, movies, reviews.